Greetings! Happy Wednesday! Last weekend we snuck away for a quick holiday in Napa Valley, California. And of course we visited our favorite vineyard, Viader! I was looking through some of my photos and thought I’d share a few of my favorites! My husband and I scheduled this trip to Napa over a month ago, well before the fires ravaged many acres of land out there. We watched and waited, unsure if there would be anything left after the devastating fires. And although the fires were very serious and damaging to some areas, we were assured it was safe to come. So we went! 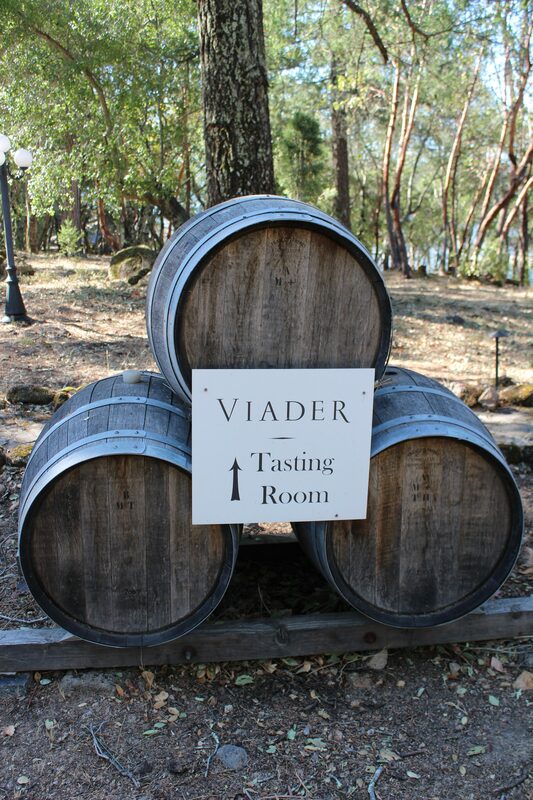 Several years ago my husband and I were in Napa on a company sponsored trip and one of the vineyards recommended to us was called Viader. We made an appointment for a tasting and it immediately became one of our favorites! Not only is the vineyard itself breathtakingly gorgeous, but the wine is heavenly. They specialize in Cabernet Sauvignon and also make a delicious Cabernet Franc. I promise the pictures don’t do it justice. The grapes were recently harvested. Viader was established in 1986 by Delia Viader who hailed from Argentina. After moving to America with her four children, she securing a loan from her father, and purchased the Howell Mountain property. She then set out to create a world class vineyard. She planted the vines European style on the side of the steep mountain. By planting the vines this way, it makes the vines struggle to survive, which enhances the flavors of the grapes. Viader has limited production and only produces about 4500 cases of wine year. Thus, making it difficult to find elsewhere. They do offer club memberships and you can call for a by-appointment-only wine tasting. I believe the tasting was $60 per person but most wineries wave the fee with a purchase. And you get to sip wine and take in this view…. This is the entrance to the underground facility where Viader makes and stores their own wine. They built it a few years ago, so this was new to us this trip. It was nice to get a personal tour. And finally, this was an illuminated sign in the restroom. I couldn’t help but snap a picture. I don’t know the author of this quote, but I love it. Isn’t this the best quote? We had such a lovely weekend. I have some more photos of other picturesque places we visited I will share later. I’m thankful that despite the fires, much of Napa is still intact and beautiful. I”m sure they will welcome visitors any time so if you are up for a visit, it’s still gorgeous! For now I am thankful for a wonderful trip with some wonderful friends! Circa Classics Distinctive Consignments-A New Favorite!